Ariete Coffee Grinder is a product made for those who want freshly ground coffee every time they need a strong and tasteful morning drink. Its adjustable cup size, as well as the choice between 15 grind settings, makes it perfect for picky ones either. 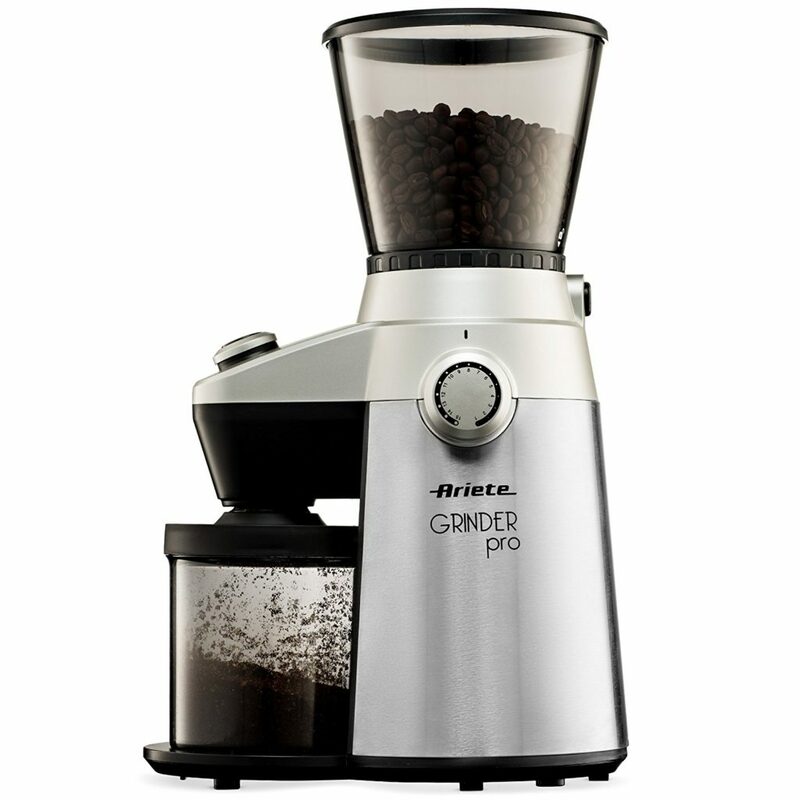 Its price makes it affordable for almost everyone, and you actually get a great conical burr grinder for the money that you pay. Value for money ⭐⭐⭐⭐⭐ Its price completely justify its quality. You will be satisfied with this powerful burr grinder. Ease of use ⭐⭐⭐⭐ It is actually easy to use this grinder, the only problem is the amount of coffee you want to grind because there is no precise measurement for quantity ( there are approximate measurements in the chart in the user manual). Quality of build ⭐⭐⭐⭐⭐ Most of its parts are made of high-quality plastic but the conical burr grinder is made of stainless steel. Features ⭐⭐⭐⭐⭐ This burr grinder has really good characteristics, their diversity gives you many options. Customer service ⭐⭐⭐⭐ We can’t say their customer service is perfect but you can always contact their call center on 855 927 4383. Noise level ⭐⭐⭐⭐⭐ It is not inaudible, but it’s not loud like other burr grinders. Click here to learn more about Ariete -Delonghi Electric Coffee Grinder, read the customer reviews or buy it. Grind Settings: there are 15 grind settings: 1-2 is extra fine grind for Turkish coffee, 3-4 is fine grind for espresso, 5-6 is medium-fine grind for pour over brewers, 7-8 is medium grind for drip coffee makers and steam espresso machines, 9-10 is medium coarse for Chemex, 11-12 is coarse grind for French Press and Percolator, and 13-15 is extra coarse grind for cold brew coffee and cowboy coffee. Cleaning: every part that is involved with a coffee can be removed and easily cleaned. Cup Size: on the front side of a coffee grinder there is a cup size button. You can choose between five options which are determined with the time of 10, 20, 30, 40, and 50 seconds. Here you have to adjust the grind settings and the amount of coffee in Tbsp ( in manual there is a table that makes this more understandable). Dimensions: With the dimensions of 14” high. 9” deep. 5” wide, it won’t take too much space on your kitchen counter. A great choice among the grind settings. Every part can be removed and easily cleaned. It is really quick since it needs only 50 seconds to grind the whole bean hopper. Have to use little force to remove the ground coffee container. Grinds remain in the coffee chute and you have to shake it hard to clean it. A little confusing way of determinate the time and amount of coffee to be ground. Like every other coffee grinder, this one has some bad and good sides, all that depending on what is exactly what you need. What is an advantage for someone, for someone else can be a disadvantage. It all depends on needs and desires. Ariete vs. Capresso Infinity Burr Grinder: Which Is Best To Buy? Ariete alternative will be Capresso 560.01 Infinity Conical Burr, with similar features and same price. Some users said that the appearance of the Ariete coffee grinder isn’t that representative and that they wanted something modern on their kitchen counter. That is why they decided that the Capresso 560.01 is a better choice. The Coffee Supremacy team can not agree with them. For us, Ariete is on the best burr coffee grinder which you can get for that budget. Next story How To Clean A Coffee Maker Without Vinegar? I still don’t understand how to use it. What are the little bean pictures for. How do I use them? I feel like I’m just dialing randomly. Please help.